Gyoza Machine AD-10G | Daiei Engineering Co., Ltd.
Gyoza (Dumpling) machine (Model : AD-10G) automates a series of processes such as pastry strip making, pastry wrapper punching, deposition of stuffing, wrapping and forming into Gyoza, and delivery onto conveyer. Firstly put the stuffing (mixture of meats and vegetable) and kneaded dough into the stuffing hopper and dough hopper, respectively. 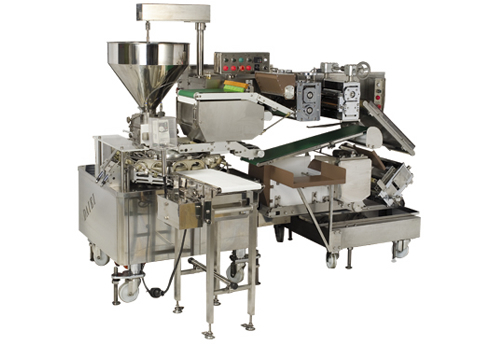 After that ,the machine automatically makes round wrapper, put it on the shell type mold ,deposits the stuffing onto the round wrapper, then wraps and forms into Gyoza in the rotating shell-shape mold, and finally delivers onto the conveyer. 1) Its products have less weigh variation, less-damaged stuffing, and handmade like shape. 2) Allow you to use pastry wrapper with higher moisture content. 4) Sound during operation is very quiet.